The Managing Director of the Nigerian Ports Authority (NPA), Hadiza Bala Usman has stated that the Organisation is fully committed to the welfare of women especially those in the Maritime sub sector. She made this statement yesterday while addressing stakeholders at the 2019 MMS Hall of Famers’ Day and a night of Empowerment in Lagos. The Managing Director who was represented by the General Manager, Corporate and Strategic Communications, Engr. Jatto A. Adams called on Women in all areas of endeavour to always prove their worth, because according to her, attaining a great feat in life has nothing to do with gender, but performance. 1. L-R: The Representative of the Managing Director, Nigerian Ports Authority (NPA), and the General Manager, Corporate and Strategic Communications, Engr. Adams Jatto, presented a Certificate of Recognition to Barr. 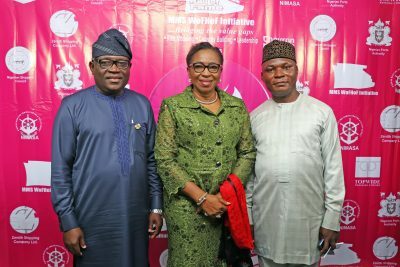 Ms. Obiageli Obi during the 2019 MMS Hall of Famers’ Day/Night of Empowerment in Lagos yesterday. 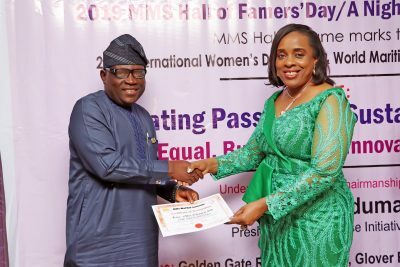 She further urged women to seize the opportunity offered through women empowerment programmes to better their lot thereby contributing most meaningfully to the growth of the Nation’s economy. 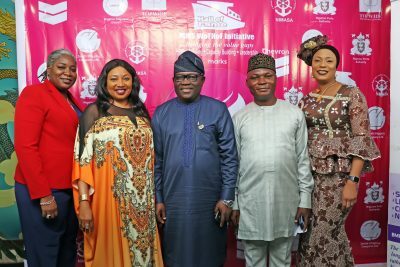 The Managing Director commended the organiser for the theme “Empowering Women in the Maritime Community” which she said is in line with the International Maritime Organisation (IMO) 2019 World Maritime Day. Earlier, the founder of MMS WOFHOF initiative, Kingsley Anaroke disclosed that the advocacy for gender parity requires concerted efforts by all stakeholders if the mission must be achieved. 2. L-R: The Representative of the Managing Director, Nigerian Ports Authority (NPA), and the General Manager, Corporate and Strategic Communications (C & SC), Engr. Adams Jatto, the Managing Director, Le Look Nig. Ltd, Chinwe Ezenwa and the Founder, MMS WoFHoF Initiative, Kingsley Anaroke during the 2019 MMS Hall of Famers’ Day/Night of Empowerment in Lagos yesterday. Mr. Anaroke further called on the Federal Government to introduce a gender character policy like the existing Federal Character principle to reflect the sensitivity of the United Nations SGDs on equality with 40 per cent employment opportunity reservation for women in both public and private sectors. 3. The Representative of the Managing Director, Nigerian Ports Authority (NPA), the General Manager, Corporate and Strategic Communications, Engr. Adams Jatto, (middle) the Asst. Gen. Manager, New Business Development, NPA, Nana Yakubu (2nd from left), the Founder, MMS WoFHoF Initiative, Kingsley Anaroke (2nd from right) and the Asst. Gen. Manager, Environment, NPA, (right) and the Senior Manager, C & SC, Victoria Tarfa (left) during the event. The event featured presentation of certificates of recognition to nine women. 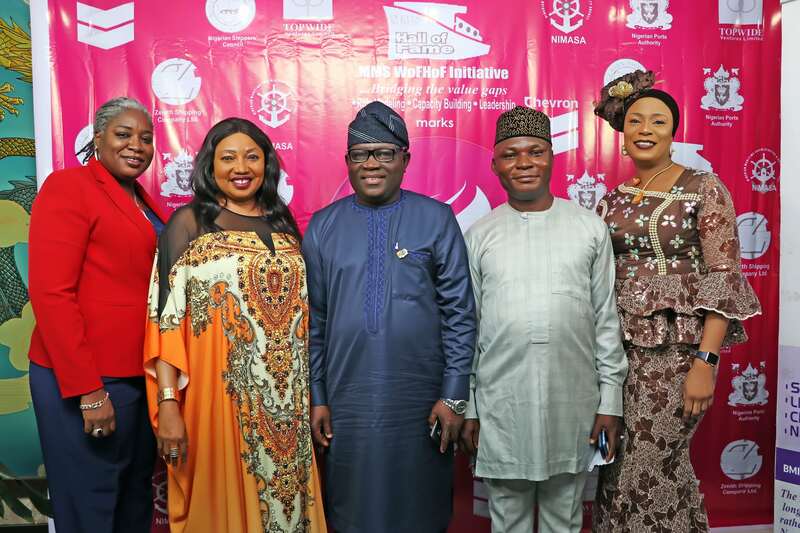 Amongst whom were; Mary Hamman, Ifeoma Ezedinma, Khadijat Sheidu – Shabi, Obiageli Obi, Folake Soji-George, Nneko Obianyo, Nana Yakubu, Macfoy Rollen and Felicia Mogo for their contributions to the growth and development of the Maritime Industry.